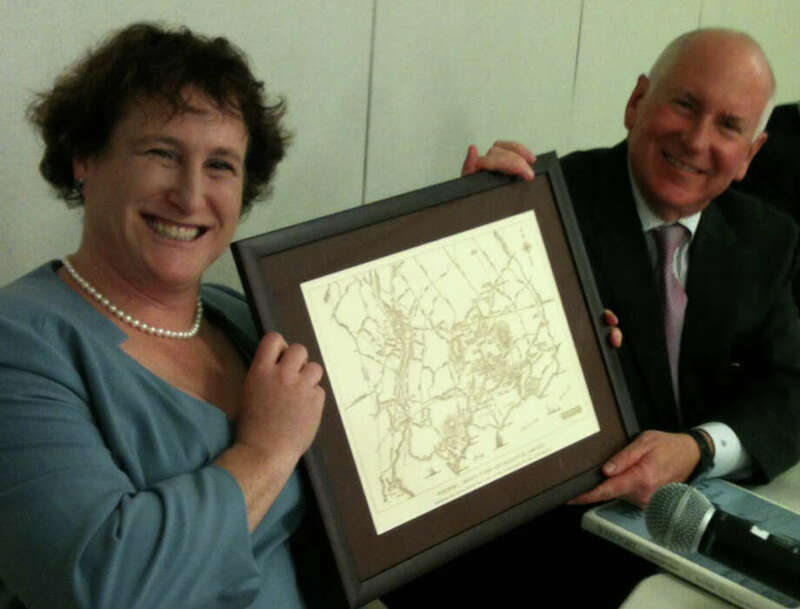 Elaine Whitney was elected chairwoman of the Board of Education Monday night on a unanimous vote, while James Marpe, resigning as acting chairman this week to explore a run for first selectman, received plaudits and gifts from fellow board members. No other school board member was nominated to serve as chairman, and the nominations of Michael McGovern as vice chairman and Michael Gordon as secretary were also unopposed and approved on unanimous votes. The school board members' new positions are effective for a year. Marpe, who nominated Whitney for the board's top officer, said no one is more qualified and prepared to serve as chairwoman, and he cited Whitney's work in contract negotiations with school district employees and her service on the Connecticut Association of Boards of Education and on a state Department of Education task force that designed performance evaluations for principals and administrators. Marpe said Whitney, a Democrat who joined the board in January 2009 and whose children attend Bedford Middle School and Staples High School, also has professional experience in health insurance and that he was confident the board's non-partisan reputation would continue with Whitney at the helm. "And just in case you didn't think she was tough enough for this job, she was captain of the Yale women's rugby team," Marpe said. School board member Mark Mathias, who seconded Whitney's nomination, praised her "incredible attention to detail" and said she "has been relentless in her pursuit of excellence in schools." "Elaine has demonstrated a willingness, desire and ability to get the job done," Mathias said. "Elaine has demonstrated that both her heart and mind are in the right place when it comes to the town's children." Whitney offered "a very quick but deeply felt thank you to all. I appreciate the support." McGovern, a board member for five years, noted that the vice chairman serves as chairman if the chairman is absent, and he presented Whitney with a large bottle of Vitamin C. "It says just take one a day. If you take two, I would appreciate it, and your bodyguards are waiting outside," he quipped. After the election of officers, school board members praised Marpe for his nearly eight years of service on the board, saying he worked well with fellow board members and town and state officials, fostered a non-partisan approach to the board's work, was well informed of educational issues at the town, state and federal levels, and brought a strategic and long-term perspective to the board. They said Marpe also asked the right questions and ensured that all sides were understood. Marpe had been the board's acting chairman since August, after then-Chairman Donald O'Day left the panel to focus on business responsibilities. Superintendent of Schools Elliott Landon said he would miss Marpe, and admired how Marpe, a Republican, worked in a non-partisan way on issues that could become partisan. He said Marpe was a problem solver and "engages in research-based decision making." Board of Finance Chairman Avi Kaner, referencing the economic crash of 2008, said to Marpe, "Even during these lean times, difficult times, not only did you protect the school system from possible cuts and deterioration, you improved the school system." Whitney said Marpe was "a dedicated advocate for maintaining the excellence of the school system." Whitney presented Marpe with several gifts, including a book on the history of Staples High School and a map of the town of Westport. Marpe said he was "touched, frankly a little embarrassed, by your accolades" and that his service on the school board was "more rewarding than I could have imagined." "The reward is knowing in some small way I am helping a great school system stay great. The most important thing we do as a society is to educate all of our children," Marpe said. "People have said, `I bet you won't miss those long Monday night meetings,' but, in fact, I will." Marpe praised Landon, fellow board members, Westport teachers and school district staff and PTAs and added, "We are also fortunate enough to live in a community that values public education and is willing to support it." Marpe's resignation means the board has an open seat for a registered Republican. The deadline to submit an application is noon Dec. 11, and the school board plans to appoint a new member Dec. 17, Whitney said.